We’re off to see the Wizard…well, almost. You the reader may have noticed a lack of Unity posts in my blog stream. That’s likely because most of my encounters with Unity involve a great deal of expletives not to be repeated even in impolite company, and quite frankly, the nightmares of my adventures still haunt me. But here’s one episode involving only minor cursing and if you are encountering this issue, you will once again want to send me flowers and offer to wash my car in gratitude. So, say you are a Unity administrator and you have hired an eager young engineer that has naively agreed to take on your administrative voicemail responsibilities. You, snickering the entire time, happily launch the Unity web interface and proceed to assign the Default Administrator class of service to your young Jedi’s voicemail account. Just as you press enter and begin to feel the burdensome weight of responsibility lifting off your tired, hunched shoulders, you are greeted with this party pooper. Determined not to be dissuaded, you do like every other time things do not cooperate from the Unity web interface, you proceed to log into the Unity box as the end-all-be-all Unity Administrator account – with all the rights and permissions the great and powerful Permissions Wizard bestowed upon thee at time of install. But you find that even the preeminent Unity Administrator is greeted with the same darned* message. Typically one would be tempted to re-run the Permissions Wizard at this point in the troubleshooting process, and I totally understand that instinct. If you haven’t dealt with Unity much, often times its administrative accounts mysteriously lose the permissions required for Unity to chug along at its assigned tasks. Unity accounts somehow fall unknowingly into a Bermuda triangle where they are subject to losing attributes that you *know* were previously assigned. There is no logical explanation for their disappearance, but looking behind the curtain and consulting the great and powerful Permissions Wizard often sets the accounts straight and returns order to the universe. And you get a shiny pair of red shoes**. 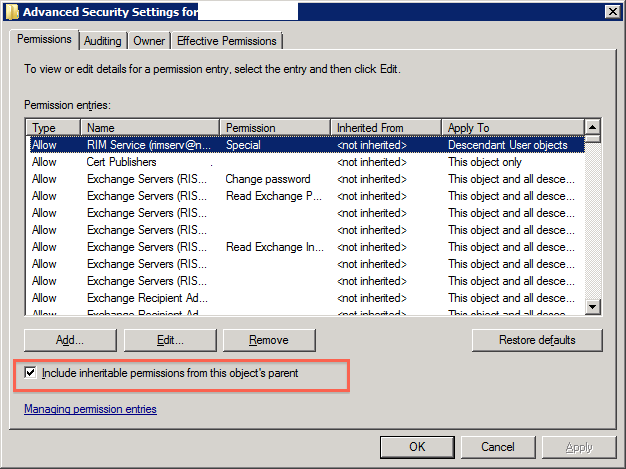 But, before you follow the yellow brick road off to the Wizard, go ahead and open in Active Directory the account of the user you are trying to add the Default Administrator class of service. Yes, I know this may require talking to one of *those* server guys, but sometimes it’s a necessary evil. You see, this has to be checked not only on the account of the person attempting to change the class of service to Default Administrator, but it also needs to be checked on the account of the person you want to shirk your Unity administrative tasks onto. Once that box is checked, you should find assigning the class of service no longer generates the error, and you are free to take your vacation and leave the new guy holding the bag. Tags: Error hr=0x80070005 (E_ACCESSDENIED): Failed to commit changes.